Our poor boat is pretty filthy, she hasn’t had a good bath in almost a month and there’s some routine maintenance to take care of that is better done comfortably berthed in a Marina. We leave our sweet spot at anchor in Zihua Bay and aim for the Ixtapa Marina, literally just around the corner, no more than an hour away. 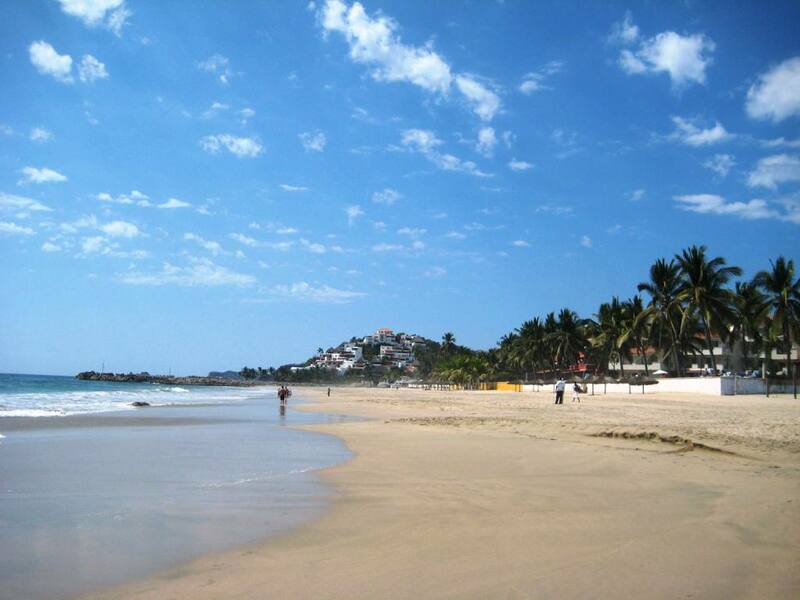 The scenery changes dramatically, going from the quaintness of the little homes on the hills overlooking the Bay of Zihuatanejo to the high-rises luxury hotels and condominiums on the long beach of Ixtapa, truly a man-made tourism hotspot. The Marina welcomes us. After a quick stop to refuel we take residence in a comfortable slip close to many of our friends. We’re all here with the same objectives: cleanup, maintenance and chores. 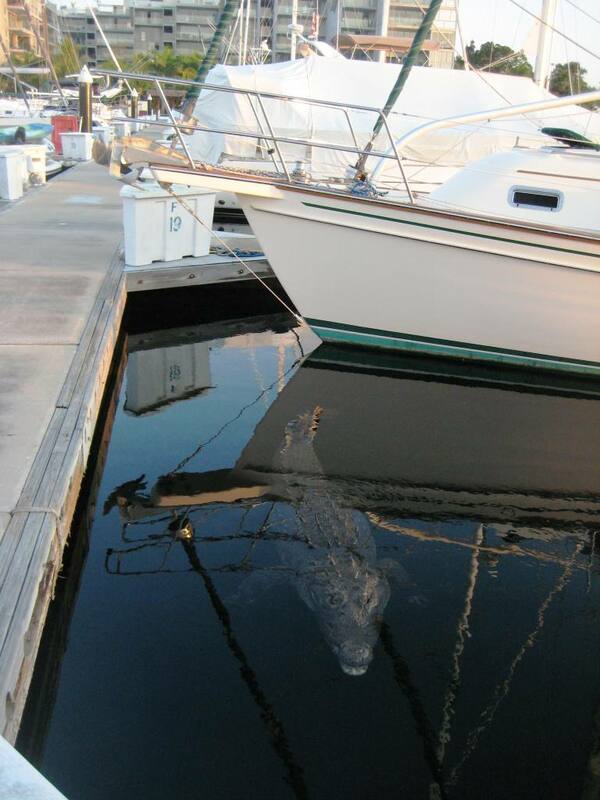 The “on the dock” entertainment consists mainly of the visiting resident crocodiles. 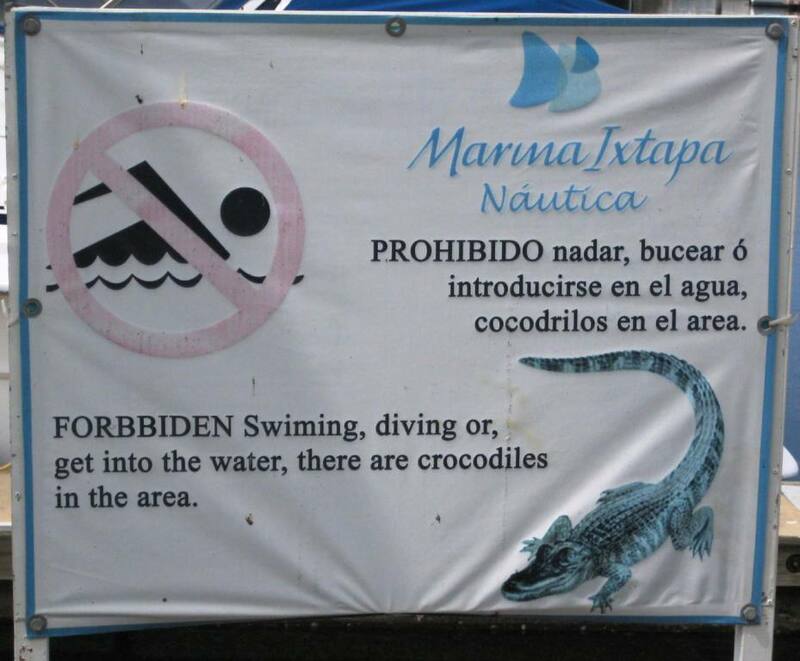 Yes, there are a few crocodiles IN the Marina and they come around the boats at dusk, swimming in the empty slips, eyeing the tasty-looking humans. I noticed only ONE cat in the neighborhood, no dogs. It is strongly recommended to keep small children and pets in your arms while walking the docks… I’m mildly concerned and ready to run for cover as I observe our visitor, but can’t stay away from Pancho (that’s his name). Inviting Welcome to the Marina! We spend our “down-time” walking the neighborhood, discovering awesome places to eat. Hey, I found a place that makes pizza as good as the ones I got in Rome! Sadly, after three pizza meals in a row, Tom forced me to change destinations… But I’m going to sneak in one more time before we have to leave! There’s a famous burger joint in town, called Reuben’s Burgers. And you know those Americans, always looking for a good burger! So on Saturday evening a group of ten hungry Gringos takes off from the Marina (us included), with murder in their eyes and burgers in their hearts… Nobody got hurt, we all got our (huge) precious cheeseburgers with delicious fries and all the trimmings. Peace restored, food coma follows. That, however, didn’t prevent us from getting a memorable dessert upon returning to the Marina. Even in this infernal heat we take long, pleasant walks. 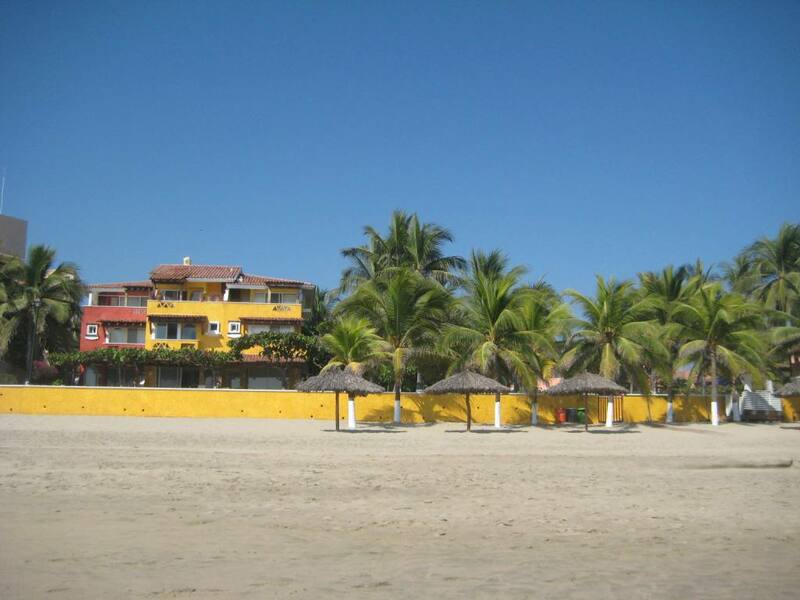 The beach access is just across the road from the Marina and strolling with your feet in the (warm) water makes you forget that you’re getting scorched… We must have walked for about a mile before making a beeline for a friendly hotel with a pool, it was high time for a cold drink! Restored, we resume our walk, this time choosing the main street for our return to the Marina. The street is lined with palm trees, there’s abundant shade, no way could we have tolerated the heat otherwise. 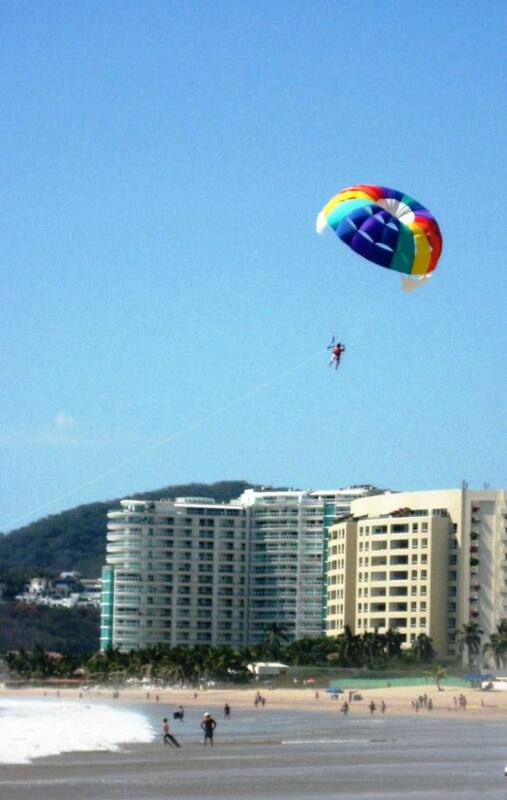 Ixtapa is filled with world-class hotels and high-end condos, restaurants of all size, shape and kind, amenities, local craft markets; you name it, it’s here. 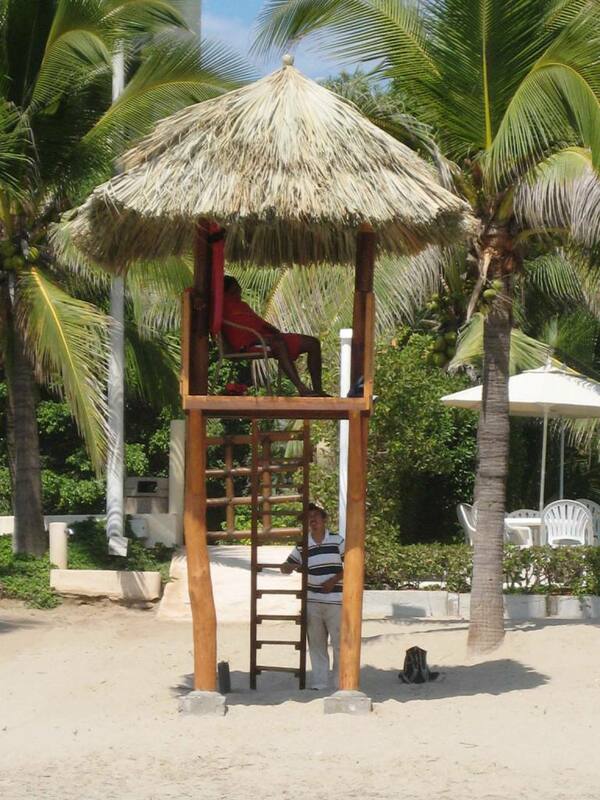 Even Club Med! 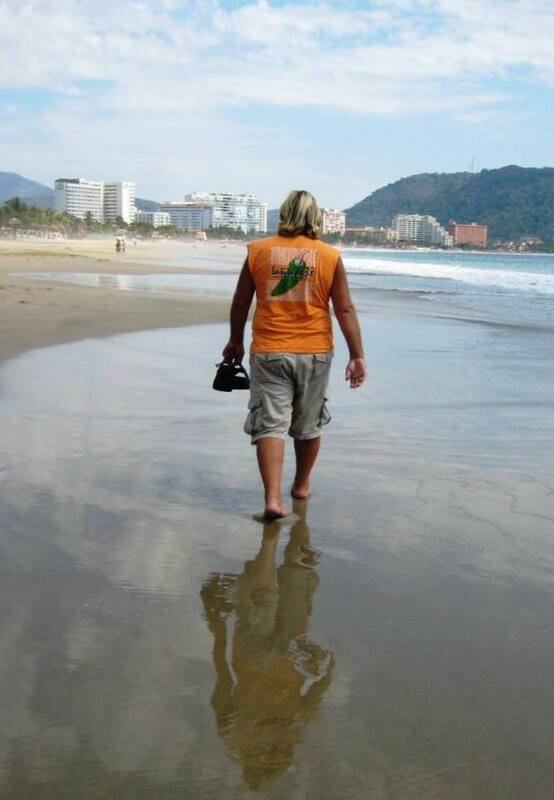 But the tourism industry on which Ixtapa and most of the Mexican Coast is based is clearly suffering, there aren’t many tourists around, some local operators told us there’s a mere 10% of the usual presence. « Tue Feb 8th – Zihuatanejoooo!